The Little Cloth Shop is an independent luxury childrenswear brand where vintage design meets beautiful fabrics and construction. 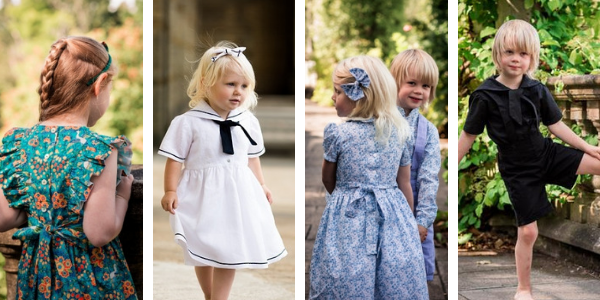 They specialise in sailor suits and nautical dresses, flower girl and bridesmaid dresses, along with a traditional gothic range for girls and boys. The outfits are inspired by designs from the 1940’s and 1950’s, using heritage Liberty of London fabrics, giving a distinctly British charm. Each piece is personally designed and meticulously handmade to order, with exacting attention to detail, right here in Great Britain. From start to finish they have full control on its fit and finish, ensuring beautiful quality. They can make your outfit specifically to fit your child’s body size. A rare thing in this modern age. To enter, simply answer the following question and complete your details. In which city is the Little Cloth Shop based?